Gillikin D. Retrieving History of Medicine citations in MEDLINE/PubMed. NLM Tech Bull. 2012 Jul-Aug;(387):e6. 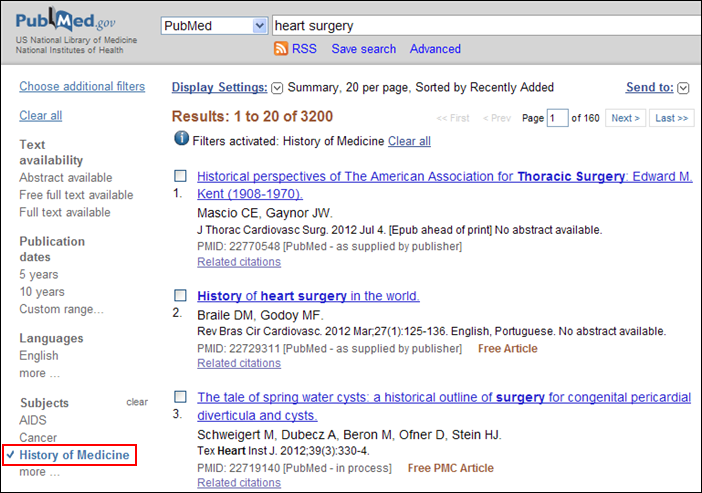 Searching PubMed for articles relating to the history of medicine has become easier with the introduction of the new PubMed left hand filter sidebar. 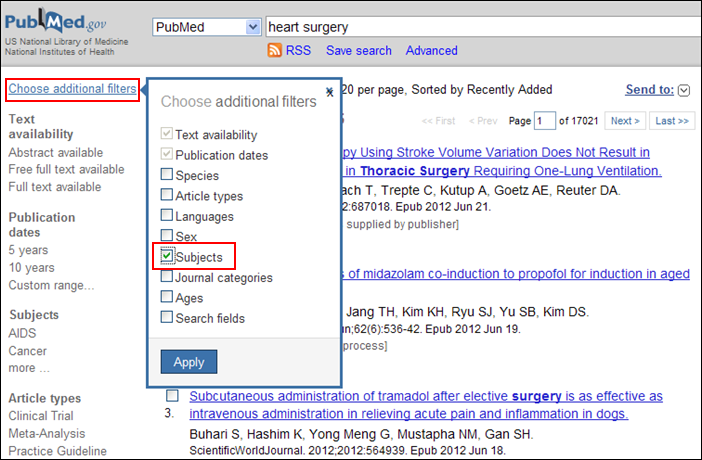 The filter sidebar allows users to easily select different filters to apply to a PubMed search (see PubMed Filters Sidebar Replaces the Limits Page). On the filters sidebar, the "Choose additional filters" option lets you add the Subjects filter (see Figure 1). The Subjects filter contains an entry for the pre-existing History of Medicine filter (see Figure 2). This will limit your search to articles that have been indexed to the topic "History of Medicine" (see Figure 3). This filter is based on a search strategy that retrieves articles indexed with terminology related to the history of medicine as well as articles from journals identified as covering this subject area. Figure 1: Adding the Subjects filter to the PubMed sidebar. Figure 2: Select the pre-existing History of Medicine filter. Figure 3: History of Medicine filter is activated. An alternative approach for choosing the History of Medicine filter is available on the PubMed Special Queries page, which is accessed from the PubMed homepage by clicking on the link "Topic-specific Queries" (see Figure 4). On the Special Queries page, users can click on the link "History of Medicine" (see Figure 5). This will take you back to the PubMed homepage with the History of Medicine filter automatically turned on. Your subsequent searches will be limited to articles pertaining to the history of medicine. 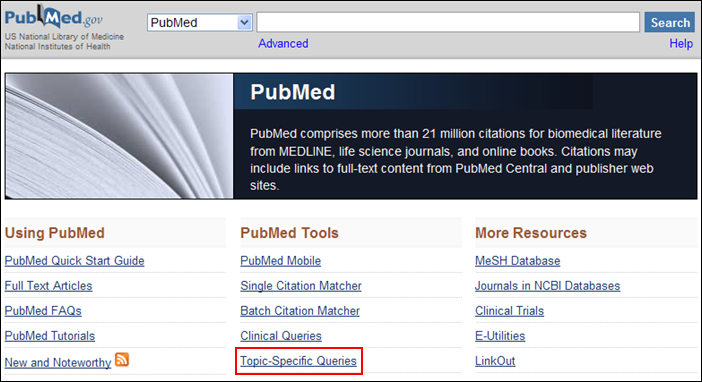 Figure 4: Topic-specific Queries link on the PubMed homepage. 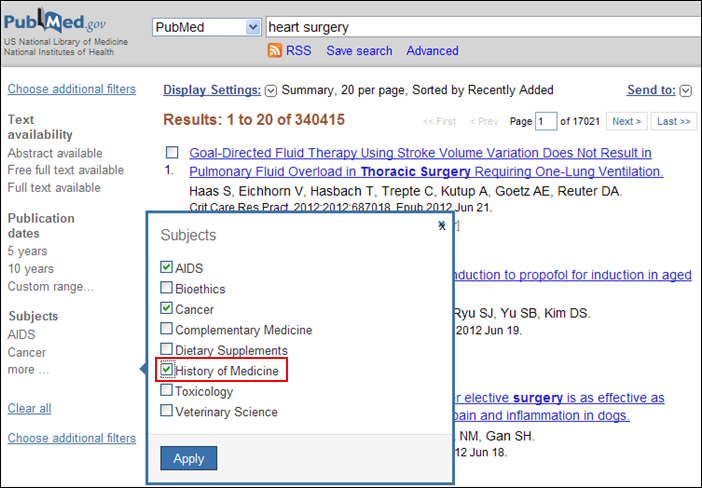 Figure 5: Click on the History of Medicine link on the Special Queries page to turn on the filter. 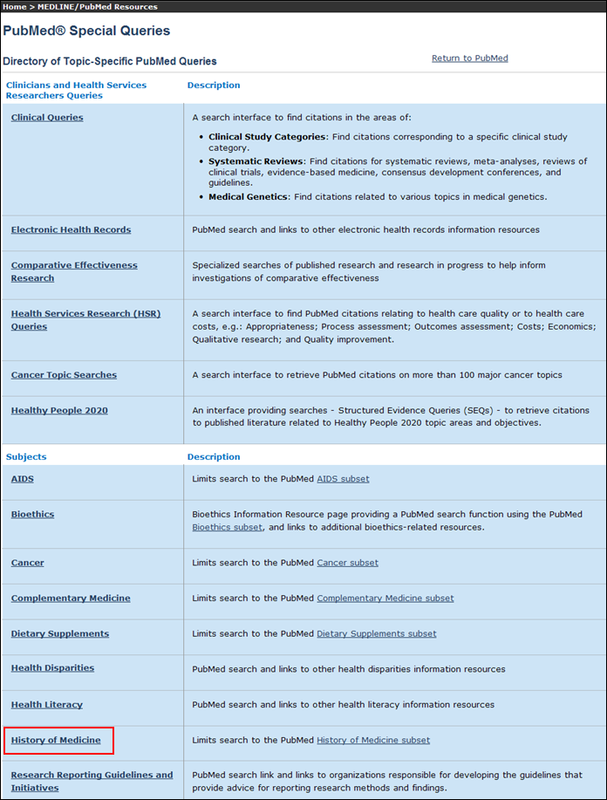 In MEDLINE/PubMed, articles pertaining to the history of medicine have been selected either from journals reviewed and approved for MEDLINE inclusion or are hand-selected from other journals identified by NLM History of Medicine staff. Beginning in October 2012, new MEDLINE/PubMed articles on the history of medicine will only be provided from journals formally approved for MEDLINE/PubMed. This move will ensure greater production efficiencies in the selection and indexing processes. All previously selected citations will remain in MEDLINE. Journals not currently approved for inclusion in MEDLINE/PubMed are encouraged to submit an application; information about this process is found on the Fact Sheet: MEDLINE Journal Selection.